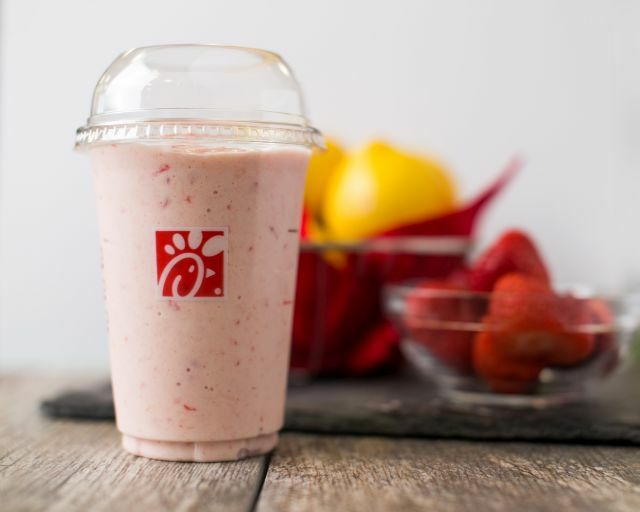 Chick-fil-A starts the spring with the debut of new, seasonal Frosted Strawberry Lemonade. The limited-time menu item can be found at Chick-fil-A restaurants nationwide and features a hand-spun combination of fresh-squeezed lemonade (or diet lemonade), vanilla Icedream soft serve, and strawberry puree. Frosted Strawberry Lemonade joins a Frosted beverage line up that includes Frosted Coffee and Frosted Lemonade but will only be available through May 20, 2017. Pricing on the new drink/dessert starts at $2.99 for a small (14-ounce cup). Frosted beverages were first introduced to the Chick-fil-A menu in 2015 with the arrival of Frosted Lemonade. Frosted Coffee was added in 2016.